In a hyper-Art Deco 1930s Manhattan, Waring Hudsucker (Charles Durning), president of Hudsucker Industries, has flung himself off the top floor of the downtown headquarters. With company stocks about to go public, the board of directors, led by Sydney J. Mussburger (Paul Newman), plots to depress stock prices by hiring an incompetent president as a scapegoat and then buying back the company. 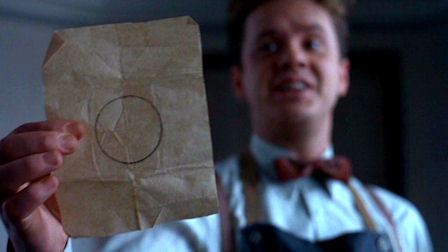 That incompetent proxy turns out to be oblivious business student Norville Barnes (Tim Robbins). But that’s only the beginning of the Coens’ madcap screwball parody that satirizes every rung of the workforce ladder, from the mailroom grunt to the head honcho. Believe it or not The Hudsucker Proxy was meant to be the Coen Brothers’ first big-budget production. Producer Joel Silver (Lethal Weapon, Die Hard) had so much faith in them after Barton Fink that he handed them complete artistic control. I don’t know what it was about their early films that screamed “mainstream blockbuster,” but Hudsucker is a clear sign that they never intended to sell out. Especially since they hardly sold any tickets, winning back less than $3 million of their $25 million budget. Most critics blasted the movie for its lack of emotional core, with no sympathetic protagonist. And I can’t exactly argue against that. But I also can’t imagine the movie working quite as well had we truly cared about the characters. The Coens have a remarkable ability to find dark humor in everything, and this is one of their darkest in that it treats every character mercilessly. They won’t let us latch onto Robbins’ Everyman because, in this zany world, he’s just as much a fool as the oppressive, villainous corporation. Hudsucker utilize visual cues to characterize the different echelons of its New York City. 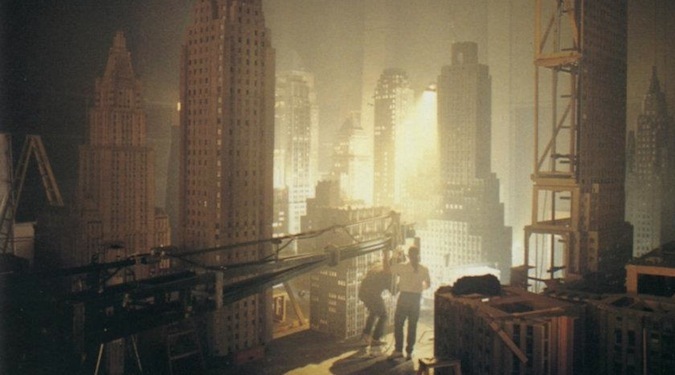 With their first-time big budget, the Coens built an entire not-so-miniature model of the city. The straight lines signify a rigid hierarchy, as well as the entire population’s upward aspirations. 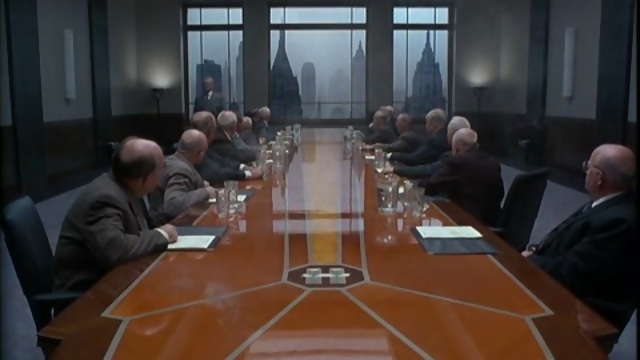 At the top of this totem pole, following Hudsucker’s untimely suicide, the boardroom is in disarray. Figuratively speaking of course, since no one would dare step out of line. A very strict, straight line. While the masses clamber to get to the top, Waring Hudsucker is on the express train (read: gravity) to the bottom. His suicide puts a revolving door in motion that will send Norville Barnes straight up to the head honcho’s office. When Barnes gets the chance to leave his mark on the company, he presents his brilliant, new, literally-out-of-the-box idea. The opposite of the city’s rigid grid. A circle as empty as his head. The long and short of it is that the Coens have mastered visual symbolism. But why stop there? There’s no limit to the innovation in their storytelling. At times, with its impeccable slapstick timing, Hudsucker plays more like a Golden Age cartoon than a mild Frank Capra comedy. Every shot is an opportunity for a visual gag, from Barnes hopping around with his foot in a flaming waste basket, to a message board flashing ever-disappearing job openings. When it comes to screenwriting, the Coen Brothers are far more akin to Mussburger than Barnes: confident, rigid, and precise. There’s allegedly little room for improvisation on a Coen set, not because they’re authoritarian, but because the script is so perfect to begin with. In the Hudsucker board room, words are sparse. Power is a willingness to subjugate yourself to your superiors. Keeping silent often means keeping your job. But for the rest of the city, words are currency. The faster you talk and the more metaphors you use, the stronger you are. Watching reporter Amy Archer (Jennifer Jason Leigh) spar with the other newspaper men requires all of our attention to catch every barbed zinger. But don’t get too tired or you’ll miss whatever gag awaits in the next shot. And the shot after that. And the shot after that.